1. Podcasts. I recently started a new non-theatre, non-arts job. For the last couple of years I’ve been mostly working from home and now I have a job that requires me to get dressed and leave the house five days a week. So far I’m finding it’s a nice change, though the commute is taking a bit of getting used to. Instead of setting up at the kitchen table, my trip to work now involves an hour-long bus journey. I’ve been using these hours to listen to podcasts, including This American Life, Start-up, RTE’s Drama on One and Roisin Meets… As a result, I am really enjoying my journeys to and from work. 2. On my way to work on Thursday morning I listened to Joanne McNally and PJ Gallagher talking to Roisin Ingle about their new show Separated at Birth. It was a great conversation about the show and adoption in general. It was informative and a bit sad in places, but mostly very funny. The show sounds like it will be more of the same and will be an absolute cracker. If you enjoyed Singlehood last year, you definitely want to check this out. They are in Vicar Street on May 8th and touring around the country over the summer. 3. The International Literacy Festival Dublin program was launched on Thursday evening. This used to be the Dublin Writers Festival and I’m not a fan of the new name. I don’t know why they changed it. Dublin Writers Fesitval had a wonderful exactly-what-it-does-on-the-tin simplicity to it. It was a festival of writers, whether they were song-writers or poets, writing fiction or non-fiction, for adults or children. It celebrated writers in a very inclusive way. The International Literature Festival Dublin sounds exclusive and elitist. It sounds like a festival for people who get great pleasure from seeking out the obscure and the high-brow. People who say things like “I prefer their early stuff” and let award long-lists dedicate their reading. It also sounds like it was produced by a random festival name generator. Thankfully the programme is not as exclusive as it’s new name and features lots of interesting people. I’ve already got tickets to Jon Ronson and I want to see Johann Hari, partly because he featured briefly in my Collaborations play, but mostly because his book about the war on drugs, Chasing the Scream sounds fascinating. I’d like to see Irvine Welsh and the Alice in Wonderland 150 anniversary event. They are also looking for bloggers, if that’s something you’d be interested in doing. 5. Live Collision Festival. My favourite live art festival is back and I’m not out of the country this time! Details of the ticketed events are now available here and it sounds like there will be other, smaller events happening as well. Bristol-based company Massive Owl are are inviting three Dublin-based artists/companies to join them as Artists In Residence at this year’s Live Collision International Festival. One of the reason I love books and reading (see last post) is because you can do it for free. All you need is a library card and away you go! (Note to authors and publishers: don’t panic, I have a healthy book-buying addiction as well as a library card.) I’m going through a bit of cash-flow crisis at the moment (I’m broke) so I have seen very little theatre lately, which is probably another reason why I’m writing about books. Theatre are be an expensive habit but are a few ways to save some money on your theatre tickets. Early Bird Offers. Theatres love early bookings because it lets them know the theatre won’t be empty, and they can relax a little bit. They want you to book early so they offer discounts. Project Arts Centre offer 25% off the ticket prices for most shows, if you book two or three weeks in advance. At the moment, the Dublin Dance Festival are offering early bird discounts for all their shows until March 29th. They are also doing Dance Deals where you get money off if you book 3 or more shows at the same time. Previews and matinees are often a bit cheaper than other shows in the run. Sometimes different days can be cheaper than others. Tickets for Romeo and Juliet at the Gate are €20 for previews, €25 for a Monday night mid-way through the run and €35 on a Friday night. It’s worth being flexible about when you go to see a show. Be a friend. A lot of friend’s schemes are prohibitively expensive but the Abbey have some reasonably priced ones. The best of the bunch is the Cameo Club which is open to under 26s and students of all ages. It’s €10 a year and you get half price previews and €10 standby tickets. If you don’t meet the criteria for that, Chorus membership is €25 and gives you half price preview tickets and priority booking. Offers on Facebook and Twitter. If you can’t afford a friends subscription, friend your favourite theatres, festivals and production companies on Facebook or follow them on Twitter instead. This is where they will often post about special offers or run competitions for free tickets. For The Walworth Farce, Landmark were offering €20 tickets for unemployed theatre go-ers, purchased on the day and for Rough Magic’s Everything Between Us, they had a limited number of €10 tickets for under 30s. If social media is not your thing, consider signing up to their mailing list. Volunteering for festivals is a way to get to see shows for free. Most festivals offer free tickets in exchange for the shifts you work and sometimes you will get into the shows you’re working on. There are loads of good reasons to volunteer but the free tickets are definitely up there. The Dublin Dance Festival are currently looking for volunteers. Application close on Friday, 17th April. This Sunday is International Women’s Day. It has been celebrated on March 8th since 1975 but Women’s Day has existed in various forms since the early 1900s, often in connection with the labour movement. It’s a day for celebrating the achievements of women and also for recognising the inequalities faced by the women and the work that still has to be done. Here’s a list of events and articles about women in the arts and culture. 1. The Women of the World Festival at the South Bank is now is it’s fifth year and it just seems to get bigger every year. The line-up is always incredible and yet I’ve never actually managed to get over to London for it. Luckily they are very good at putting all the talks online. Everything from the past three years is up on their YouTube channel and no doubt this year’s talks will join them. 2. Previous WOW speaker Emer O’Toole will be on the RTE Book Show on Saturday evening at 7pm, celebrating IWD with Lisa Hannigan, Norah Casey, Viv Groskop and presenter Sinead Gleeson. The Irish Times have been celebrating Irish women writers all week and all those articles are collected here. (Watch out for the paywall.) This weekend the paper will include an all female version of the famous Irish Writers poster that you see all over the place. Fintan O’Toole called it a joke with a serious point. 3. I read a couple of great articles on women’s “madness” this week. Mad in inverted commas because generally the behaviour being dismissed as madness is just simply behaviour that deviates from the norm, ie it’s not how men behave. Or it is a logical reaction to how the women in question have been mistreated. B. N. Harrison writes about The Unified Theory of Ophelia: On Women, Writing, and Mental Illness for the Toast and Julie Holland writes about Medicating women’s Feelings for the New York Times. 4. Another area where women face discrimination and struggle to tell women’s stories is on the screen. You only had to look at the recent Oscars to see the lack of women in the writing and directing categories, and the lack of women in general in the Best Picture nominees. This matters because popular culture matters. It shapes how we see the world and it needs to include women, in front of and behind the camera. A group working to improve this is Women in Film and TV International. The Irish branch is currently making a come-back and you can find them on Facebook. 5. If you want to hear more about the many and varied issues that affect women’s equality, the National Women’s Council are holding a Soapbox event today, outside the Central Bank in Temple Bar from 12 – 4pm. Last year over 35 women shared their thoughts and experiences from the Soapbox. This year’s speakers will include a wide range of women from Ireland’s artistic, political, musical and journalistic community. I don’t know about you but I am ready for winter to be over. I’ve had enough of the cold weather and the dark evenings. Recently there have been some small hints that maybe spring is on it’s way. There’s that stretch in the evenings and the colourful crocuses poking up out of the grass. 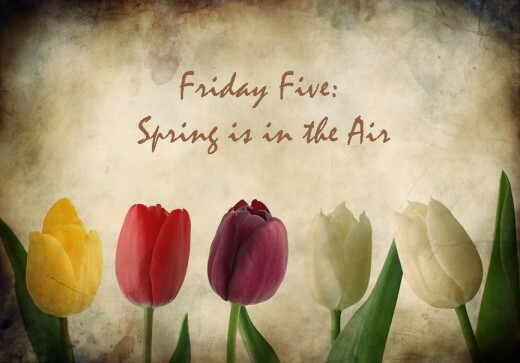 So here are five things that are all about looking forward to spring and summer. Be a tourist in your own town. Now is a good time to do this before everywhere gets too crowded with real tourists. Visit museums and art galleries and pretend to be on holiday. If the weather is being cooperative, get outside and wander around Glasnevin Cemetary or the Botanic Gardens. Or if you’re free during the week, take advantage of the free Wednesdays at the OPW heritage sites. On the first Wednesday of every month, there is free admission to all their sites. In Dublin this includes the state apartments at Dublin Castle, Kilmainham jail and the Casino at Marino. Here is the full list of sites. While we’re on the subject of museums, and I know I’ve already mentioned it once or twice here before, but I finally got down to Collins Barracks to see PALS last week and I can’t recommend it highly enough. It is a beautiful and heart-breaking show. It focuses on one group of men, the 7th Battalion of the Royal Dublin Fusiliers who had played rugby together before heading out to the doomed military operation in Gallipoli. Their stories are told with all the emotion and immersion that I’ve come to expect from an ANU show. They manage to deliver small, gentle moments and big, swooping world-changing ones, and both can be equally heart-breaking. It’s a gorgeous show, go see it. Beer gardens are another joy of summer and while the weather might not be suitable just yet, that’s not stopping Project Arts Centre from celebrating their newly done-up beer garden on Friday, March 6th from 6pm. They are promising some super value drinks promotions, tasty pizzas and Siobhan Kane on the decks. And if you’re still there at 8pm, you can head in to see Carmel Winter’s new play Witness. Summer is a good time to get together with friends. Get the Boat to Vote is an initiative to encourage recent emigrants to come home for the Marriage Referendum on May 22nd by making it a bit of a occasion! Tell your friends living aboard, tell them to sign up, come home and then plan a party for all those returning emigrants. And one last shout-out to the Collaborations festival which is now in it’s final week. There are still lots of great shows to see and there is a great buzz around Smock Alley with so much on. It’s been an absolute pleasure to be part of it and I’m hoping to see some shows next week, once we’ve done our final show of In Protest Of… tonight. The Abbey have started putting the Theatre of War sessions online. Here are my top five talks/panels/sessions from the three days. It’s was difficult to choose only five because the symposium was full of interesting things. I’ve cheated a little bit because Day 3 hasn’t gone online yet. If it was, I would have had to include Marina Carr’s talk Art, Beauty, War about the women in Greek plays. The talks are about an hour long, the panels are closer to an hour and a half. 1. David Cotterrell, Subjective Documentary. David was commissioned by the Wellcome Trust as a war artist and sent out to capture the war in Afghanistan. His talk covers information about how the public perception of the war is managed, and how difficult (if not impossible) it is to prepare for the horrors of war. And this was in a war hospital/camp, rather than a conflict zone. It is a terrifying insight into those unseen areas and very interesting to hear it from a non-military person. 2. Patrick Cockburn talked about The Rise of the Islamic State and the situation in the Middle East. I found it fascinating to hear someone speaking so knowledgeably about a subject that I only have small, scattered chunks of information about, but very little understanding. It seems like Islamic State have appeared out of nowhere, but Cockburn described how it was really not a complete surprise. It was bubbling for a long time. 3. Artistic Response to Conflict and War. There were so many interesting people on this panel, it’s definitely worth a watch. John Scott talks about his work with survivors of torture, people who have come to Dublin. Hope Azeda talked about making theatre Rwanda and was so incredibly enthusiastic and inspiring! Dijana Milosevic speaks about DAC theatre in Belgrade and Naomi Wallace and Ismail Karim Khalidi read from her play One Short Sleepe. 5. War Correspondents was a performance from Helen Chadwick Song Theatre and it was a lovely way to end the second day. Helen interviewed war correspondents and put those interviews to song. Again, it’s a great insight into the lives and work of those people but it’s also a simple and beautiful performance piece. The songs will stick in your head! It’s not a full performance, more a taste of what the show is like.